The One Click Wonder that allows simultaneous wireless connection to your AV system! Barco Clickshare is a clever device that allows multiple people to simultaneously connect to your meeting room’s AV equipment wirelessly. Using the Click button that is plugged into your laptop via your USB point, you can connect to the equipment in the room and share images, data, video and sound. Up to four people can share the screen at a time or one person can take over the whole screen when necessary. High resolution transmission is automatic from laptop to AV screen and there are no technical issues to worry about, saving a lot of time and frustration. 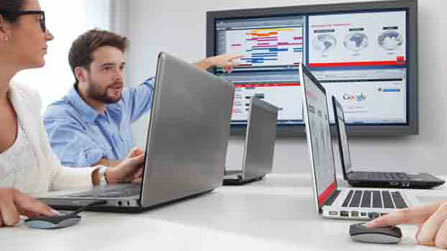 For more information about Barco Clickshare, please call 01733 204214.